Zack Arias has had his hands on a Fuji X100T, at least a pre-production model. We know how he loved the first one, how he loved the improvements of the second generation, how he love the X series. 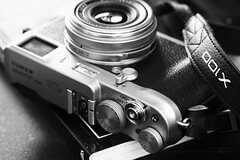 Faster, better wifi, classic chrome, better buttons standardized on the rest of the X-series, new hybrid viewfinder. Petapixel today: Fuji Unveils the X100T with ‘Electronic Rangefinder’ Function, Improved Controls and More gives us some news from the product announcement. It is great to see Fuji iterating over to improve things and the hybrid viewfinder improvement are, I hope, a shape of things to come for the 2nd generation X-Pro1 that is rumoured. Just check the pictures if you are curious. Do not attempt! Zack Arias with “Why I moved to medium format” explain us why he bought a Digital Medium Format for his professional work. He also uses a X100 for his own personal work. All this said, I really do like this camera. I feel let down a bit by the UI, but I also know time will soften this as I get more used to this camera’s quirks. Photo by CoffeeGeek – Some rights reserved.